How did you become a writer? Did you always know you wanted to be one? Growing up in India, I never thought I'd be a writer. I didn't believe I had either the talent or the drive or a special story to tell. But immigration thrust me into a whole different world which was at once exciting and disconcerting in its newness. I wrote to make sense of my new life, and to remember the life that I had left behind. You often set your books in India. What attracts you to the Indian landscape? The landscape of one's childhood imprints itself upon the heart. In my case, that was India. Add to that the fact that Indian culture is old and complex and currently, due to globalization, undergoing a rapid transformation, and you have possibilities for many stories. In Oleander Girl, for instance, the two protagonists, Korobi and Rajat, come from very different families. Korobi's is steeped in tradition; Rajat's is westernized and newly rich. When Korobi and Rajat fall in love, this will lead to many complications. A family secret lies at the heart of Oleander Girl. What made you decide to focus on this? My own family had a dark secret of its own. When I discovered it, it turned my life upside down. I felt betrayed by the people I had trusted all my life—and yet I couldn't stop loving them. I wanted to explore these painful, contradictory feelings through Korobi's situation. She is braver than I was—she traveled across the world in search of that secret. Do you write your books in English, or in some other language? I write all my books in English. My mother-tongue is Bengali, but English was the language of my schooling. I read Bengali fluently, and when my mother was alive I wrote letters to her in that language. She told me once that it was a good thing I didn't write anything else in Bengali! (I think my vocabulary is at the 6th grade level). I do participate, though, when my books are translated into Bengali. Oleander Girl is set in the year 2002. Why did you decide on this time period? An important question in Oleander Girl is how can we live in amity with difference, both racial and religious? The year 2002 illustrates the price we have to pay when we choose not to do so. In 2002, in the U.S., people were suffering the aftermath of 9/11—both the tragedy of the deaths in the Towers and elsewhere, and the violent fear and prejudice that swept the nation and affected the lives of many Americans who looked like I do. In India, 2002 was the year of the terrible Godhra Riots that led to deadly clashes between Hindus and Muslims. How did you come up with the title of this novel? In what way is it central to the theme of the book? The heroine Korobi's name means Oleander in Bengali. From childhood, Korobi wants to know why her mother, who dies in childbirth, would want to name her after a flower that is beautiful but poisonous. She will discover the answer at the end, and along with that she will understand what kind of woman her mother wanted her to be. And this—how women need to balance between what they owe others and what they owe themselves—is an important theme in the novel. I'm working on a novel that is a re-working of our famous epic, The Ramayana. I am re-telling it from the point of view of Sita, the central woman character. The teller of the tale changes the meaning of the tale. By putting a woman at the center of an epic adventure, I hope to draw attention to different issues and make readers re-evaluate their beliefs about what is heroic. Oleander Girl was recently released in paperback. You'll need to run out and grab a copy. It's lovely! See my review here. 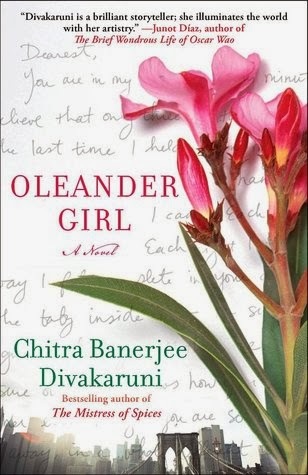 Even if I have not read Oleander Girl yet, I have a feeling I will like the book. I think it's great that Chitra Banerjee Divakaruni will re-work The Ramayana. I remember studying about it in secondary school. It will be interesting to read it. I am so going to run out and buy this book. And it's wonderful that Divakaruni is working on a retelling of the Ramayana from Sita's point of view. I will have to get that too when it comes out. Exciting times.